NYCEDC’s Yankee Stadium Parking Debacle: Who Woulda Thought? In news that should surprise no one, the taxpayer-financed Yankee Stadium parking garages have been declared an unmitigated disaster. Anyone could have seen the deal was a loser from the start — that a sports stadium served by subways, buses and a new commuter rail station, a stadium that would have fewer seats for fans, would have no need to increase parking stock by 55 percent. Then there was the dirty business of seizing public parks, and counting on the fact that the garages would attract drivers year-round — drivers who would be willing to pay more to park at the stadium than at the nearby Gateway Center mega-mall — to an area that neither wanted nor needed more car traffic. It was a scheme so predictably wrong that no private developer wanted any part of it. Among those privy to the nuts and bolts of the deal, it seemed the only ones oblivious to the fact of its eminent failure were former Bronx Borough President Adolfo Carrion and the folks at the New York City Industrial Development Agency, the financing arm of the New York City Economic Development Corporation. In an act of blind faith or incestuous backroom dealing — take your pick — the IDA issued well over $200 million in triple tax-exempt bonds to the non-profit (ha ha) Bronx Parking Development Corporation to build and operate the garages. Four years later, as Crain’s reports, the garages are a bust — with “more competition than any party involved anticipated,” they “were never more than 60 [percent] full on game days.” Bronx Parking is expected to default on the bonds, and the neighborhood has thousands of unused parking spaces where there was once public parkland. The potential irony has some in the community seething. Borough President Ruben Diaz, Jr. and others are hoping to draw a hotel to the area, which would presumably make use of some of the excess stadium parking. Bronx Parking officials, meanwhile, blame cheaper rates at Gateway Center, and “Metro-North and its new train station … which the company said is reducing the number of cars — the very purpose for building the station (with public money).” But not everyone considers more traffic a solution. “Shortsighted” — a generous word for a billion-dollar subsidy based on a foundation of extortion and cronyism, rather than sound economics and community interest. Speaking of extortion, the additional parking spaces are a consequence of the Yankees demanding it as a condition of their staying in the Bronx. The Bronx political leadership, including then Borough President Freddie Ferrer who now works at a liberal think tank, was determined to keep them there regardless of the cost to the city as a whole. Instead, local residents lost their parkland. I was prepared to contribute to the funding of some buses to take them to New Jersey, and not just because I’m a Mets fan. But New Jersey wasn’t dumb enough to pony up for them. The city ended up bidding against itself. It’s almost like the Mets signing Oliver Perez. The Bronx pols should be aware that the agreement with the Yankees precludes the elimination of the parking, although it might be extinguished by the bankruptcy of the operator. The city’s stance should be clear: NO BAILOUT. As for the argument that will be made, that a default on IDA bonds may make it harder for the city to go into debt for projects like these later, I say bring it on. There are similar defaults going on everywhere in commercial real estate. Post restructuring, new owners are able to offer space at reduced rates to fill vacancies. This would be no different. This seems like an ideal place for Manhattanites who travel north by auto (perhaps to second homes) to store or rent cars, as it is accessible from both the East Side and the West Side via a short subway ride. It’s important to point out that Zapata isn’t even talking about the garages. She’s talking about a bunch of surface parking lots with cheaper rates than the garages. This adds to the list of recent City-supported projects that greatly overbuilt parking in the same area — Yankee Stadium, the Gateway Center Mall, and East River Plaza. Has the City learned anything yet? We’re still following the 1950’s vision for NYC here . 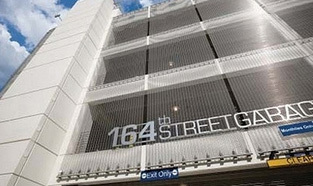 . .
Want to build parking garages? Try WaHI… we desperately need more parking spaces to free up our streets! You’re much better off with bike lanes and bus rapid transit. And less (or no) free parking. That will get rid of the cars that are taking up all your public spaces and you’ll have a bunch of cash you can put into beautifying and revitalizing the neighborhood. And believe me, Washington Heights can use some beautifying – from what I’ve seen of it, it’s a wasteland of sterile, highway like streets and not much else. If you build garages, all you’ll get is a whole bunch more cars, traffic, congestion, pollution and mangled bodies when those cars run people over. I agree with Larry Littlefield. I hope there is NO BAILOUT of the near bankrupt Yankees parking garage. And as Anon said, there are other underused parking garages that should never have been built so large. The East River Plaza (116th & FDR in Manhattan) has 485,000 square feet of retail space (currently with a PetSmart, Costco, Target, Marshalls, Old Navy, Best Buy, KidsTown, and Bob’s Furniture). It has a 1,248 space parking garage. Just as the Yankee stadium garage never reaches more than 60% capacity during games and is far less full at all other times, the East River Plaza garage has been 90%-95% empty all the times I have been there. Brad Aaron absolutely killed this story from the very beginning. If there are Pulitzer Awards for bloggers, he should get one. @RoughAcres- The garages in WaHi have plenty of space in them. People prefer free parking on the street and driving around in circles to get it (having done it myself when borrowing a car). We need to just reduce on-street parking in the hood period and/or add a yearly parking permit. Any suggestions about what should happen next (apart from no bail-out)? Any creative re-use ideas out there? Will even one person responsible for this boondoggle be fired? Will anyone, other than the people of the Bronx who lost parkland, and the tax payer, lose anything here? This is outrageous. Right after the fire someone for the massive city costs for the new New York Stock Exchange. With my boss, I wrote a carefully worded memo indicating that with electronic trading coming, this was a bad idea. The decisionmakers preferred an EDC memo that indicated that unless the city gave the stock exchange got what it wanted, NYC would end up like Detroit. The city spent a lot of money taking buildings by eminent domain at peak prices to make way for the new stock exchange, which was never built. Can Streetsblog tell us how much tax payers are going to have to pay for this fiasco? Usually bond holders lose in a default. Is that the case here? With sufficient “electronic trading” do we really need a Finance, Insurance and Real Estate sector? JK, the taxpayers already put down $70 million in the form of a nonrefundable grant from the Empire State Development Corp. The rest of the taxpayer expense comes in the form of forgone Tex revenue lost because of the tax-exempt nature of the bonds. So, actually, if Bronx Parking LLC defaults on the bonds, there is less bondholder income that doesn’t get taxed, and there’s less notional cost to the taxpayer. Although, default or not, there’s still no tax revenue coming in. Good Jobs NY did the analysis of how much taxpayers were to lose because the bonds were tax exempt. Then there’s the fact that Bronx Parking can stiff the city on PILOT or rent payments when it is under financial distress. I forget which, but think Juan Gonzalez covered it. What is no longer needed is guys on a floor yelling and screaming and trading securities that were issued in the past. Personally, I think the NYSE building should be turned into a “casino,” with day trading stations instead of one armed bandits, blackjack and roulette. Plant the parking lot with vertical and rooftop gardens and let the ousted little league teams play their games under the roof! The City Council was well aware of this stuff. It was the main issue in the full Council hearing and vote where the Yankees trotted out Reggie Jackson to testify for the overall package. The state legislature also had to vote to eliminate the park-land. I am a HUGE Yankees fan and just went to my first game of the season last night. With parking costing $35 for the game, you will never EVER see me parking in the garage. I found a free spot on the street almost immediately. I used to park in the garages for almost every game, but not this year at $35 a pop. Maybe if you start biking to the game, you can become a medium-sized Yankees fan! Anybody Interested in Tearing Down a Couple of Yankee Stadium Garages?